just another forty degree day. 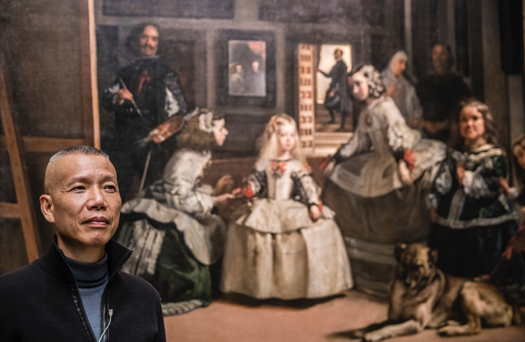 (Madrid – October 25, 2017) Cai Guo-Qiang and The Prado Museum are proud to announce the opening of The Spirit of Painting. 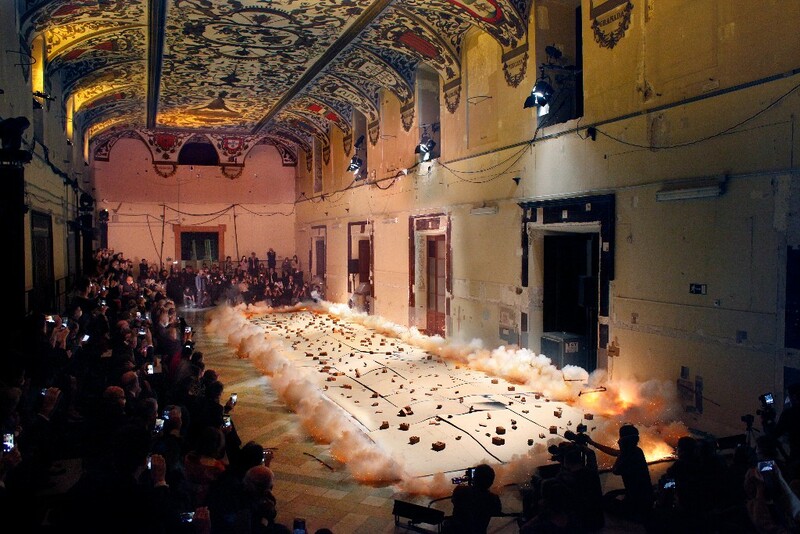 Cai Guo-Qiang at the Prado a solo exhibition by the acclaimed contemporary artist. This exhibition marks the first time an artist has created on-site at the museum, and only the second time the museum has hosted a solo exhibition of a living artist. The Spirit of Painting arose from the artist’s lifelong admiration of El Greco, and is Cai’s first solo exhibition focused solely on painting in over 30 years. For the first time, Cai measures himself against the great masters of the Western pictorial tradition through his innovative and unusual artistic technique. The Spirit of Painting will be on view through March 4, 2017. Top Left: íñigo méndez de vigo y montojo, Minister of Education, Culture and Sport, speaking before the ignition of gunpowder painting The Spirit of Painting at the Salón de Reinos (Hall of Realms), Madrid, 2017. 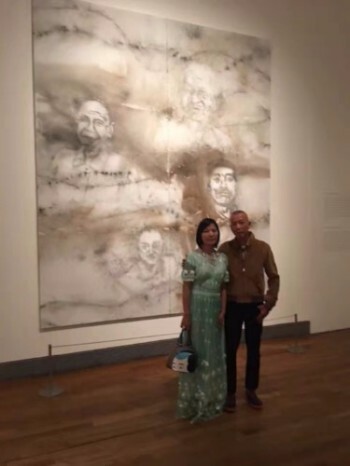 Photo by Yvonne Zhao, courtesy Cai Studio Top Right: Cai Guo-Qiang with Jack Ma, after ignition of gunpowder painting The Spirit of Painting at the Salón de Reinos (Hall of Realms), Madrid, 2017. Photo by Wen-You Cai, courtesy Cai Studio Bottom Left: Cai Guo-Qiang with Miguel Falomir, Director of the Prado Museum, íñigo méndez de vigo y montojo, Minister of Culture, José Pedro Pérez-Llorca, President of the Royal Board of Trustees of the Museo Nacional del Prado, and José Manuel Entrecanales, Executive Chairman of ACCIONA Bottom Right: Cai Guo-Qiang speaks at opening press conference. Museo Nacional del Prado, Madrid, Spain, 2017. Photo by Sang Luo, courtesy of Cai Studio. For The Spirit of Painting, Cai transformed the museum’s Hall of Realms into his studio, producing eight works inspired by the memory of the former palace of Philip IV and in dialogue with the Great Masters represented in the museum’s collection. 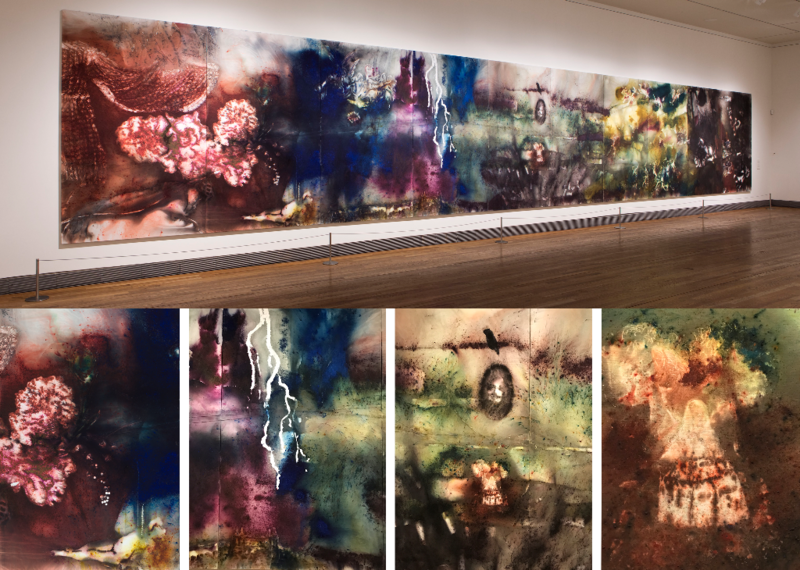 The artist’s residency, which took place in the weeks leading up to the exhibition’s opening, concluded on the 23rd with the creation of The Spirit of Painting, a monumental painting measuring 3 x 18 meters. In addition to nineteen paintings made in New York, Cai created The Spirit of Painting and seven other works in the Hall of Realms. Also on view are oil and acrylic early works, a selection of sketches, and drawings on matchboxes by the artist’s father, Cai Ruiqin. 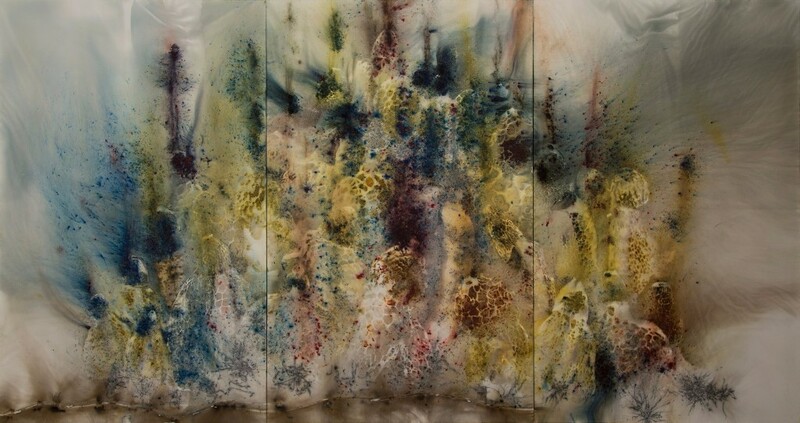 The Spirit of Painting will allow visitors to explore Cai Guo-Qiang’s lifelong dialogue with the Western pictorial tradition, particularly the spirit of El Greco. 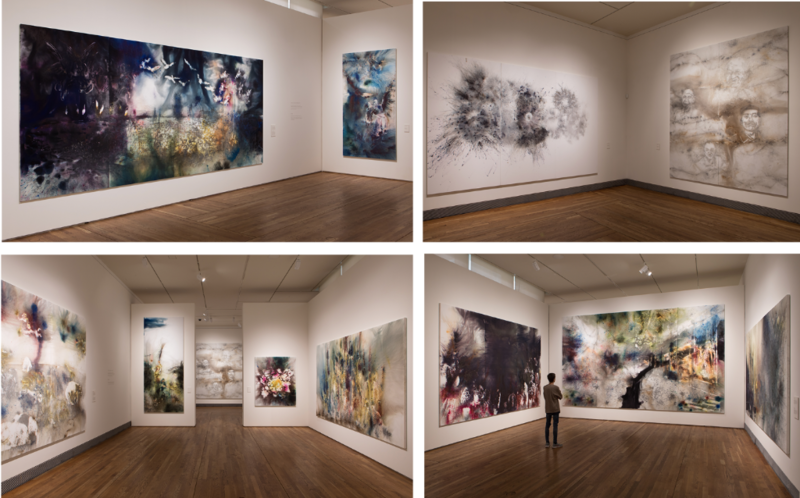 This dialogue began during Cai’s years as a student and has continued to the present day; a continuity evident in the selected early works and documentation of the 2009 journey Cai undertook to retrace El Greco’s travels from his native Crete to Venice, Rome, and, finally, Toledo. 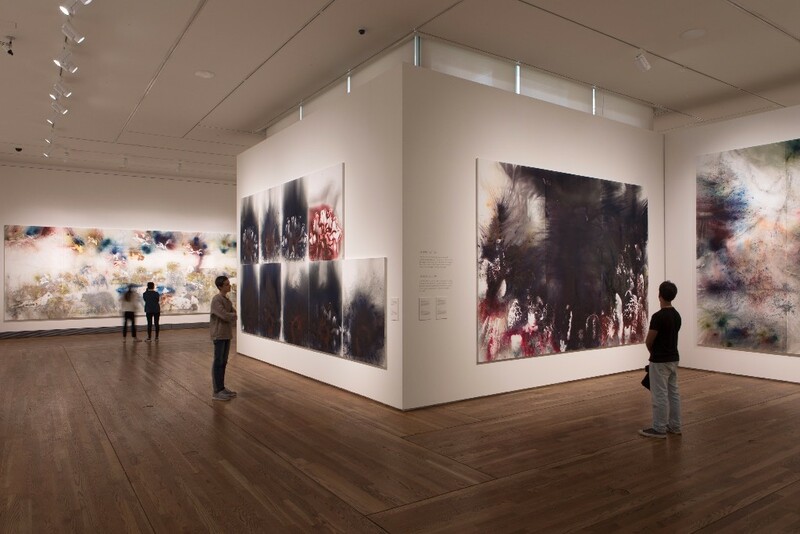 The first room illustrates the relationship and dialogue between Cai Guo-Qiang and the spirituality of El Greco. 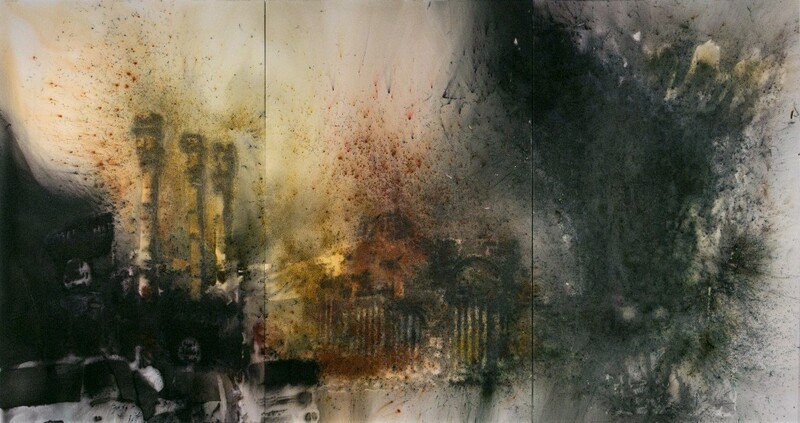 This connection inspired Cai in the early stages of his painting career, and now acts as the beginning of the exhibition. Day and Night in Toledo was the first work that Cai created in the Salón de Reinos. Cai reimagines what he saw when revisiting Toledo in early 2017 — the city from night to dawn, morning to sunset, and back to the night. The town, cathedral, valleys, and skies in the painting look as they did in El Greco’s time, forming a mirage on canvas. “As if, through an El Greco-esque energy, the past and present are overlapping in an undefined time and space,” Cai described. Painting El Greco’s Apostolado, No. 8, 9, 6, 3, 10, 7 emanate a sense of ceremony unique to classical painting. For each Apostle, Cai arranged gunpowder between two canvases, laid face-to-face on the ground. Ignited together, two paintings emerge—the lower canvas is more figurative and the upper one more abstract. “As though extracting an imprint of spirituality,” Cai explained. With the group of studies In Search of El Greco, No. 3, 6, 8, 9, Cai experiments with gunpowder and explosion to better understand El Greco’s painting technique, including the flow and expression of color, light, and energy. The second room inherits the spirituality of Rise, but is more personal and pure in its artistic expression. The works displayed are dedicated to the artist’s loved ones who have passed away in recent years. In Black Ceremony, Cai explodes on a blank space his desolation and helplessness at losing his hundred-year-old grandmother, his father, and father-in-law in the past few years — it is more abstract, more boundless; in The Distant Clouds, he uses raw black gunpowder and gunpowder fuse from Valencia to express his pining for and remembrance of his loved ones. 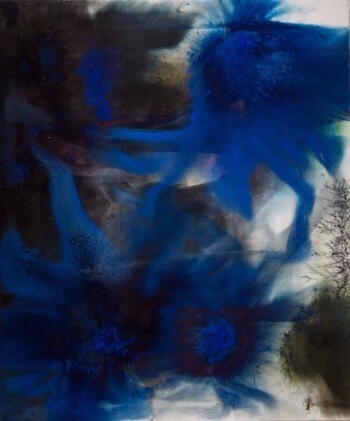 Three other abstract paintings convey the surging of emotions, and at the same time reveal the artist’s painstaking study of the materials and techniques involved in painting with gunpowder. In Mountain in Heat, layer upon layer of aphrodisiac mushrooms culminate into a mountain that bursts forth with desire. The artist strives to achieve a sense of richness and depth on the canvas, straining between the thinness and simplicity of contemporary art and the profundity and harmony of classical painting, seeking to convey a new aesthetic. Last Carnival developed from Cai’s study of the Prado’s collection of Rubens, specifically his ability to capture the dynamic movements of man and beast. At the same time, it resonates with Bosch’s The Garden of Earthly Delights. Different species of animals have succumbed to interbreeding, drawing forth an environmental theme in which living beings continue to frolic even when only one pool of water remains on the planet. Black Poppy features nine canvases; on each succeeding canvas, Cai decreased the amount of black color gunpowder until the coolly elegant black is lifted to reveal the scarlet repressed beneath. The work captures the passage of changing time. 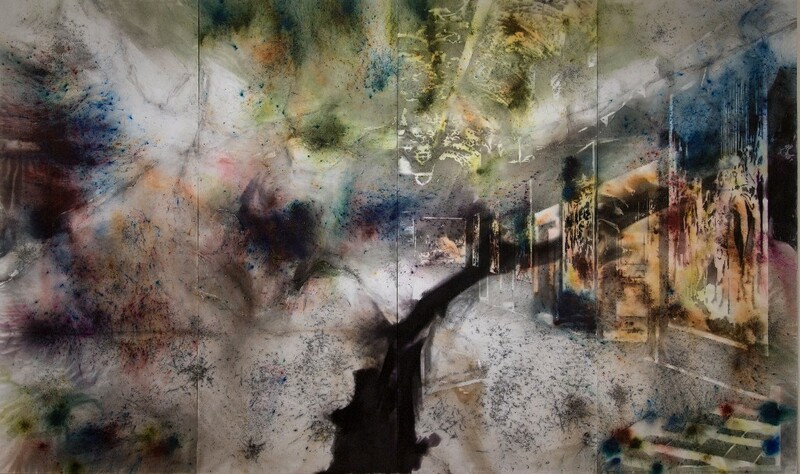 “Painting needs to express energy; here, the energy expresses itself,” Cai explains. The fourth room accumulates energy; echoing Rise, it registers a higher level of spirituality. Salón de Reinos… was ignited in the exact location captured on the canvases. It seizes the shadows of artists such as Velázquez, who competed in the Salón de Reinos. 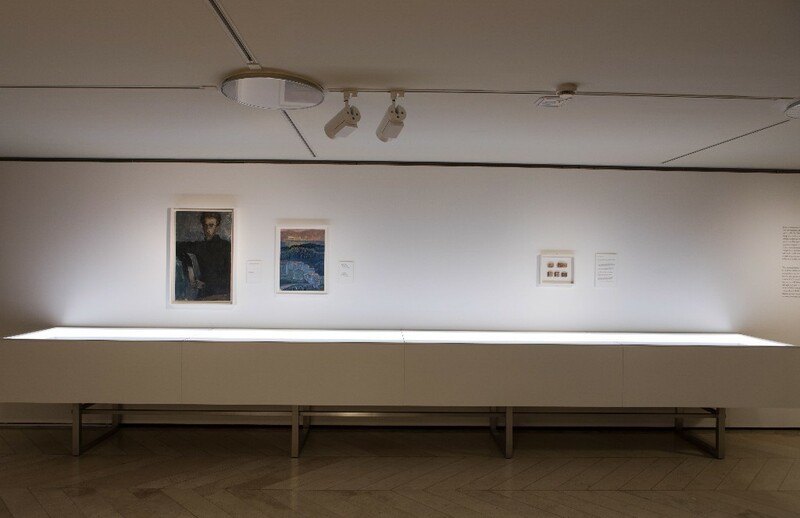 In addition to expressing his reveries at dusk while creating works in the hall over the past month, the artist also includes a phantasmal black line, subtly suggesting a blurring of time-space dimensions. A selection of works provides further insight into the origins of and stories behind the exhibition. It begins with Cai’s father’s drawings on matchboxes and two of Cai’s early works in oil and acrylic. This is followed by a recounting of his 2009 travels with his elder daughter, retracing El Greco’s footsteps from his birthplace in Crete to Italy and to Toledo, his final resting place. Select sketches inform the artist’s relationship with the Prado’s collection as well as the creative process behind The Spirit of Painting. 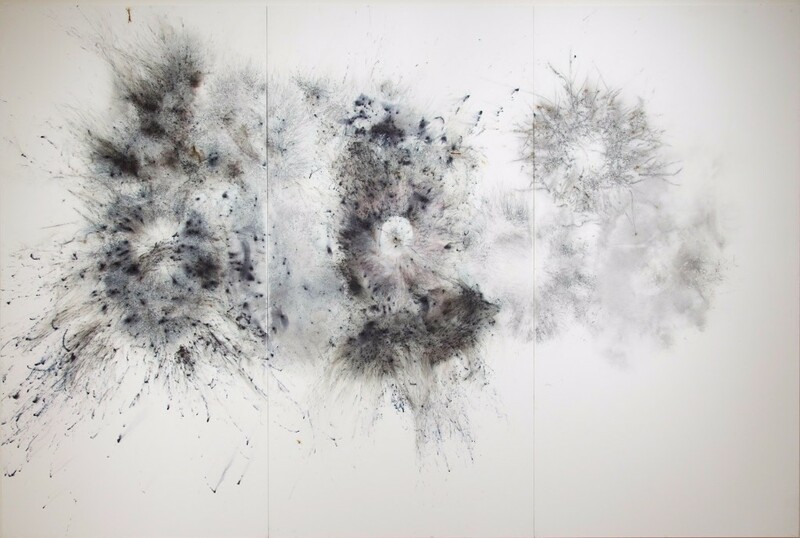 Filming took place in New York City, where Cai Guo-Qiang lives and works, on Long Island, in Madrid, during the artist’s residency in the Hall of Realms, and in Valencia and Toledo. It is produced by Miss Wasabi Films for the Prado, and will be released worldwide in late 2017. The Spirit of Painting will be open Monday through Saturday from 10am to 8pm, and Sundays and public holidays from 10am to 7pm. Guided tours of the exhibition are also offered on Wednesdays at 11am and 5pm. This entry was posted on November 7, 2017, 5:58 pm and is filed under Uncategorized. You can follow any responses to this entry through RSS 2.0. Responses are currently closed, but you can trackback from your own site.